This article first appeared in The Edge Malaysia Weekly, on January 21, 2019 - January 27, 2019. GABUNGAN AQRS Bhd is making a comeback. The stock has risen 70.4% since Dec 26 to last Thursday’s close of RM1.15. But can the rally be sustained? Based on the 100% “buy” calls from analysts, there is potential for AQRS to continue its upward trajectory. The average target price for the stock is RM1.76, which translates into a possible 53% capital appreciation from RM1.15. The stock is the top pick among ­ small to mid-cap construction and property development companies of UOB KayHian analyst Farhan Ridzwan, due to the transformation of the counter into a dividend stock. 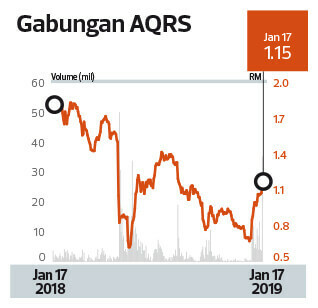 He has assigned AQRS a target price of RM1.73. Farhan says an investor who buys into AQRS will be rewarded with at least a 10 sen per share dividend per year over the next five years. That translates into a dividend yield of 8.7%, based on last Thursday’s RM1.15 price. The committed dividend payout is based on earnings from its E’Island affordable housing project in Puchong, Selangor, and The Peak high-rise residential project in Johor Baru, without factoring in earnings from its other property and construction contracts, says Farhan. “Ten sen per share is just the floor. The payout will come from earnings from property projects, especially the one in Puchong, where AQRS bought the land at a very cheap price. It is estimated that AQRS could get a gross profit margin of 30% to 40% from the project. “If the company manages to clinch the other construction jobs it has bid for and payments from the LRT3 contracts come in on schedule, AQRS has indicated it will pay a higher dividend,” Farhan tells The Edge. This was confirmed by AQRS’ largest shareholder and CEO Datuk Azizan Jaafar, who says that over the next four years, the two developments will generate RM641 million in operating cash flow, while the group would only have to fork out RM248 million if it were to pay a 50 sen dividend per share. E’Island has received a good res­ponse due to its affordability. According to Azizan, the project has received over 2,000 registrations for 1,140 units available. However, sales of The Peak are expected to be lower, as it is a high-rise, high-end residential project in Johor Baru, a market segment that is currently not doing very well, due to the large number of properties available. Last Wednesday, CBRE | WTW Johor Baru director Tan Ka Leong said the vacancy rate of Johor Baru’s high-rise residences is expected to hit more than 50% for the first time in 2019. Some 10,500 units of supply will be added to the market this year. “The company is being realistic for its Johor development, expecting a low take-up rate of about 15% in 2019, and gradually increasing in the coming years. “We believe the company can hit 15% take-up rate this year due to its strong proposition (pricing, value and location less than 8km from Woodlands Checkpoint). It also plans to offer a rent-to-own scheme, which is expected to boost sales,” says Farhan. However, what about landbanking if AQRS uses up a large proportion of its cash flow on dividend payments? Azizan says the group will not buy land, but will partner landowners, for future projects. He says the group has almost RM1 billion in gross development value and targets to sell RM500 million worth of properties this year. Prior to the general election last year, the counter was one of the high-flyers due to AQRS’ successful turnaround from obscurity to a company that won large infrastructure contracts from the then government. In October 2017, AQRS clinched a RM1.14 billion contract from Prasarana Malaysia Bhd for the construction and completion of guideways, four stations and park-and-ride facilities for LRT Line 3. It had also submitted tenders for the East Coast Rail Line (ECRL) and the Pan Borneo Highway. AQRS lost more than 58% of its market value between May 8 and June 1 last year, when it closed at a low of 62.4 sen per share. While it had recovered to RM1.42 on July 25, the counter tracked downward again after the new government confirmed the review of mega infrastructure projects. The LRT3 project is one of the projects being reviewed by the Ministry of Finance, due to the government’s huge debt obligations. AQRS has completed works for the LRT3 worth around RM150 million, according to analysts. The ongoing review of the LRT3 project has led to slower progress billings, which contributed to the 15% quarter-on-quarter revenue decline to RM159.3 million in 3QFY2018, says Loong Chee Wei, an analyst at Affin Hwang Capital. “Indications are that its LRT3 contract value could be reduced by RM120 million with a potential reduction in the scope of work. Its remaining order book of RM2.4 billion takes into account this possible reduction in contract value for the LRT3 project,” says Loong in an Oct 19, 2018, report. The research firm upgraded AQRS’ core earnings per share by 5% to 16% for FY2018 to FY2020E to reflect better construction pre-tax profit margins and lower dilutive impact from the new free Warrant B issued. It has a target price of RM1.64 per share on the counter. The Edge reported on Jan 14 (LRT3 contractors said to be owed RM800 mil for work done: Issue 1249) that as at December last year, Prasarana had yet to pay LRT3 contractors for jobs done and satisfied between February and September last year, worth over RM800 million. Without confirming the arrears, Prasarana says it is working closely with its partners and stakeholders to fine-tune the details of the implementation of the LRT3 project. “If payments from the LRT3 contract come in as scheduled, and the project is not downsized too dramatically, AQRS would be able to pay shareholders higher dividends than the 10 sen per share it has committed to,” says an analyst. Apart from the LRT3, AQRS is also one of the front runners to win contracts for the Pan Borneo Highway in Sabah. The group is partnering Suria Capital Holdings Bhd — a Sabah-owned, government-linked company — and they have bid for RM2 billion worth of jobs for the project. It is also developing the One Jesselton Waterfront mixed-use project in Kota Kinabalu. It is part of the larger Kota Kinabalu Port redevelopment project being undertaken by Suria Capital, which will see the development of a new central business district for the state capital. AQRS is also developing the Pahang government’s new administrative centre, called Kota Sultan Ahmad Shah (KotaSAS), in Kuantan. AQRS has been appointed to build 1,004 landed houses in KotaSAS for a contract value of RM189.22 million.